When you think of sourdough bread, you probably envision a crusty, chewy, artisan-style loaf. But this bread, made with levain (an overnight starter based on sourdough starter) is a richly flavored, soft-textured sandwich loaf, perfect for all of your favorite sandwich fillings and for breakfast toast as well. *All-purpose flour will produce a somewhat stickier dough. To make the levain: Mix all of the levain ingredients together and place in a covered container with room for the levain to grow. It will almost double in size, and will take about 12 hours to ripen (ferment) at room temperature (70°F). When perfectly ripened, there'll be large bubbles (mostly below the surface) creating a somewhat rippled effect. It'll appear almost fluffy. If the levain is covered with a froth of tiny bubbles, it's a bit over-ripened; but don't worry, you can still use it. To make the dough: Mix and then knead together all of the dough ingredients, including the levain, to make a smooth, supple, and not overly sticky dough. Place the kneaded dough in a lightly greased bowl, cover the bowl, and let the dough rise for 1 to 2 hours, until doubled in size. Divide the dough in half, and shape each half into 8" logs. Place the logs in two lightly greased 8 1/2" x 4 1/2" bread pans. Cover the pans with lightly greased plastic wrap (or a couple of plastic shower caps), and let the loaves rise until they've crowned about 1" over the rim of the pan, about 1 to 2 hours. Bake the bread for 30 to 35 minutes, until the crust is golden brown and the sides of the loaf feel firm. Remove the loaves from the oven, and turn them out of the pans onto a rack to cool. Let them cool completely before slicing. Does your baked yeast bread ever develop a wrinkled top surface? Here's a tip to help prevent that. Slash the top of the loaf several times before baking, much as you would a baguette. This helps release the steam that gathers under the crust, which can produce wrinkles as the baked loaf cools. Hi! My second bake of this recipe just came out of the oven...my daughter said it looks just like the bread I used to make when she was little! It's quite easy to make once you get yourself organized. I will probably make this many more times! Thank you for the recipe! A perfect recipe. I made one loaf and one batch of dinner rolls. I usually use AP flour when making sandwich bread but followed the recipe for bread flour, and was glad I did. This is a keeper. I made this for the first time today. I forgot the butter... I didn't get much oven spring, so the slices are a little small but the bread is delicious with a lovely chew! I cooked to an internal temperature of 208. Besides the butter, I'd like some hints on why I didn't get much oven spring. This recipe created a loaf that was exactly what I was looking for--something my family would actually eat while I ate my much more sour, denser levain loaf. I used all-purpose flour and next time I would use bread flour because the bread falls apart a bit if you put anything on it. Additionally, I personally am not a fan of the weird aftertaste (almost an after-texture) that I believe is from the milk. I will probably try this without the milk in it, and maybe substitute flaxseed or something else to make the loaf a little heartier...and healthier. This is a wonderful sandwich bread. I took half of the dough and made pepperoni rolls. 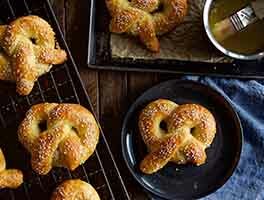 Wondering if this recipe could be changed to using all starter and no added yeast. Would I Judy use more starter? Would the texture be the same? Have made this about 6-8 times over past 3 weeks with great results each time. 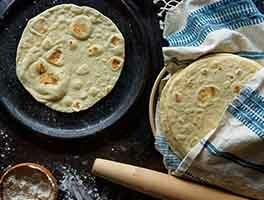 Just started making sourdough bread & have experimented a little after first few times...have used 3/4 of dough in a 13" Pullman & used rest for baked English muffins (makes 1/2 dozen about 55 grams each-375 for approx 15 minutes baking sheet on top-flip at about 8 minutes check "baked English muffin recipe"). 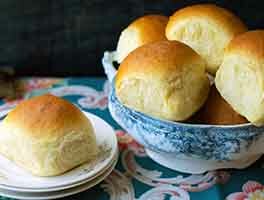 Have also made rolls with half the dough when making regular sized loaf (6 rolls a little over 4 oz each-375 for I think 20-25 minutes-don't remember exactly so If you try it just check with instant read thermometer @ about 15-18 minutes to judge time. Have a "customer" that gives me back an empty bread bag after about 3 days. I just made this for the first time. Very simple recipe to follow. Makes a nice soft bread. Though I would like more sour dough favor. It could be my starter is pretty young. I have been trying different sourdough bread recipes and this is the one that is consistently requested. Soft and moist with a tender crust. So glad the recipe makes two loaves as it goes quickly at my house. 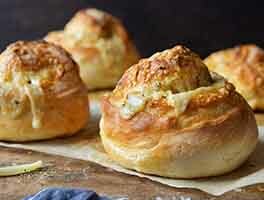 I made rolls and they were so like British "baps" I was quite surprised. This is a good recipe. As the levain, used my discarded sourdough starter that I "fed" and left out overnight. Followed the recipe completely, except that I bake for someone who can't eat milk or butter anymore. So I did not put in any dry milk powder, and I used some fancy vegan butter. 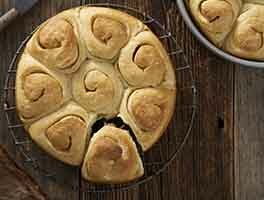 This dough rose with alacrity; I sort of manipulated it into various "roll" shapes, let them rise, and baked. 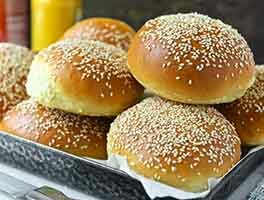 Very mild, tender, soft, not very sweet buns, again, extremely "bap" like. Everyone liked them. Hi! I have been working on my sourdough starter for the last couple of months and have made this bread three times. Each time it's getting better and better! I'm low on powdered milk and have a question. I have your whole dried milk. Could I use that instead of dried non-fat milk? I was afraid of adding the additional fat.